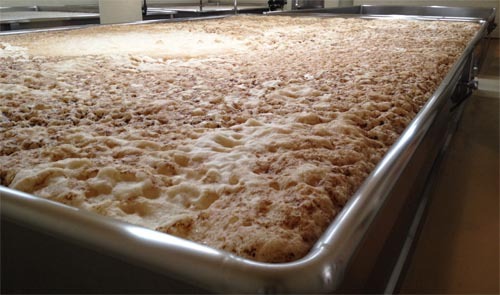 A brew of Anchor Steam Beer in an open fermenter. What is a “coolship”? This brewing term refers to a very large, shallow vat that was originally used to facilitate the cooling of hot wort in the days before mechanical refrigeration. A coolship has a shallow depth, usually 18 to 24 inches, is open to the air, and has a large surface area to radiate off the heat. Commonly used in the 19th century, coolships are rarely seen in breweries today. Open fermenters are still in use in a few breweries other than Anchor, most notably in Belgium, and have several configurations. While their function is to ferment and not to cool, the term “coolship” is still widely used to describe any sort of open fermenter.